There's a buzz around town as Obama heads down to Mexico City tomorrow morning on his way to Trinidad and Tobago for the Summit of the Americas. Since I missed the inauguration, I thought I might be able to catch The Beast around town. 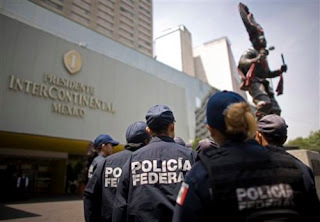 According to El Universal, Obama is expected to leave the Mexican White House, Los Pinos, at 3pm, head down Paseo de la Reforma, make a right on Arquimedes, and a left on Campos Eliseos to reach the Intercontinental Hotel. Does it seem as odd to you as it does to me that the public is able to know Obama's exact route, down to the left and right turns? Yes! But it's the kind of information this stalker girl will need tomorrow as she seizes the day. UPDATE: While I didn't see The Beast today, Obama's helicopter, Marine One, did fly right past my apartment. As usual, I went to investigate what the loud noise was in the sky, and there it was! Girl, I didn't invent the word, so steal away! Good luck with finals.